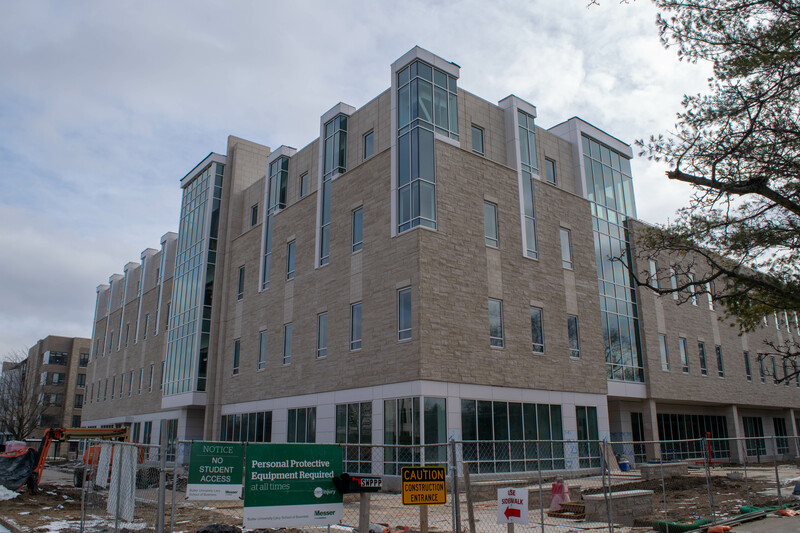 New construction projects on campus, like the Lacy School of Business, could affect sustainability assessments in the future. Photo by Mason Lovett. Butler University received a bronze ranking from the Association for the Advancement of Sustainability in Higher Education, which is an organization universities can utilize to measure their sustainability performance. The Sustainability Tracking, Assessment and Rating System self-reporting tool monitors the school’s operations, curriculum, planning and innovations, in addition to the community on campus and within Indianapolis. The assessment will be used as a reference to see where Butler needs improvement and where Butler excels. Platinum is the highest grade a school can earn while bronze is ranked fourth. Receiving a bronze ranking is a great achievement, said Julia Angstmann, director of Butler’s Center for Urban Ecology and Sustainability. Notre Dame and Indiana University both received gold this year while IUPUI earned silver in 2016. Jarrod Koester, a junior history and sociology major, is a council chair for the Butler University Green Council, a club involved in sustainability discourse and projects to support sustainable development. Along with Green Council, other organizations work to improve sustainability on campus, including the Sustainability Club, Butler Food Recovery Network, CUE Farm and more. “The more that we advocate for the students, the more the university will begin to realize what changes will need to be made,” Koester said. Haley Cowart, a junior environmental studies major, said she agreed that engagement needs to increase. Pushing things forward and implementing a plan for the future is Butler’s top priority when it comes to sustainability. Butler plans on collecting new data in about three years in hopes of improving sustainability.